How much moisture? How dry is dry? I decided to do a quick experiment to determine the amount of moisture in my soaked rice. It had been a while since I looked up how to do this and I miss remembered how much time was required. I was thinking that it required 6 hours but in fact the procedure takes 16 hours for the drying phase. This is more than twice the time I was planning. Well, I got started and weighed out two 30g samples each of Hitomebore 90% seimaibuai, Calrose 90% seimaibuai and Calrose 60% seimaibuai. Recall that the seimaibuai is percentage of rice remaining after milling the outer portion away. Having weighed the samples, I added water to one of each of the types of rice to soak for an hour. At the end of the hour, I drained and weighed the rice again and prepared it all to go into the oven at 265°F. With 10 hours in the oven, I removed the rice and weighed each sample. While 10 hours is a little short of 16 hours I was not willing to stay up till 3AM to complete the experiment. If 10 hours is close enough I’d expect that the dry weight of the wet and dry samples of each type should be the same. This is close to what I found but not quite. The final weight of the wet sample for the 90% seimaibuai was a little lower than the dry samples. Well, at least I know that there was enough time to remove the water weight from the wet samples. Based on this data we can see that both the 90% seimaibuai types had 3-4 grams of water weight. This works out to be about 13% of the wet basis (Init Dry Weight). This is well within the range of expectation for table rice. Rice milled to 60% seimaibuai would be expected to have a much lower moisture level after milling and until it has had time to absorb enough moisture to come back to the 10% expected level. The 60% rice used here was milled by SakeOne and shortly after bagged bye Steinbart’s in a sealed plastic bag. So, it is not given the chance to absorb much moisture after milling. This is just what we see in the data as well; only 1 gram of water weight. One gram works out to be only 3% of the wet basis. As discussed in “Steeping to hit the numbers,” this data shows that having a lower initial water weight results in a higher rate and amount of moisture uptake. Both samples with 13% initial water weight gain only 30% while the 3% initial water weight sample gains 60%. A moisture content of about 38% after steaming is considered optimal for ginjo-shu koji. Assuming steaming adds 10% moisture content (this is another experiment), we would like to high 28% water weight after soaking on a wet basis. Notice that, the 90% seimaibuai rice is closer to this ideal than the 60% seimaibuai rice. Based on this it would be a good idea to lower the steeping time some or raise the initial moisture content of the 60% rice to be more on the order of 15% before steeping. Tweaking this a little could improve your sake. Author WillPosted on March 19, 2012 March 10, 2019 Categories General Topics, Ingredients, Process, WaterTags rice moisture, steeping, water uptake2 Comments on How much moisture? How dry is dry? Shio-koji? What it is and how to make it. Recently, there have been a few different articles and mentions of shio-koji. I had never heard of this until these articles. I came across shio-koji through a chain of retweets from @seishu and @theprovenance originating with @ChrisPellegrini Anyway, these tweets were pointing to an article by Makiko Itoh in The Japan Times: Kōji — Japan’s vital hidden ingredient. Of course the thing that caught my eye was the use of koji. I am familiar with amazake but shio-koji with a third of the koji’s weight in salt? That seems like a lot of salt to me but most of the articles seem to imply that shio-koji used as a replacement condiment for salt would reduce salt intake. Having read Makiko-san’s article, I thought it was interesting and that I should give it a try some time. Really was not thinking about doing this anytime soon though. Then I saw another reference and another… What is going on with this stuff. Finally @keyope put up a page (now gone) with the amounts of all three ingredients, koji, salt and water. This matched very closely with almost every other recipe I see so what the heck, I’ll give it a try. I didn’t want to make a lot so @keyope’s recipe size seemed just about right to me; only 30g of salt, 100g of koji and 150ml of water. I combined this together this morning and stirred them up. They are sitting on the counter now. It turns out that 150ml of water is too much for use with my fresh koji. It would probably be a better amount for use with koji like Cold Mountain’s. I guess the best advice here is to add a little, maybe 100mls worth in this case and then add more if needed. This stuff is pretty salty tasting but we will have to wait about a week to see how it turns out with the koji enzymes transforming the basic ingredients. I’ll add and update in a week. Author WillPosted on March 4, 2012 March 10, 2019 Categories General Topics, Ingredients, Koji, ProcessTags Shio-koji? Making Shio-koji6 Comments on Shio-koji? Sake Pressing: what method to use? Recently one of the youtube channels I follow, SakaguraKaetsu’s channel, has had a few short videos on pressing. Specifically, they have a couple on filling a fune (P1020493.MOV, P1020548.MOV) and a couple showing the Fukurozuri – 袋吊り- drip process (P1020495.MOV, P1020553.MOV). Watching the great care taken to fill the bags with moromi is really impressive. They leave no wrinkles at all in the bags as they lay down one bag at a time; again, very impressive and labor intensive. When it comes to pressing, if you want to get the absolute best sake out of a batch you should use the fukurozuri method to produce Shizukazake – 雫酒 – or Shizuku – 雫 – for short. This method is very simple, just fill a bag with the fermenting moromi, tie it up so that it hangs above a collector for the dripping sake and let it drip. The resultant sake, slightly greenish yellow is by no means clear. Time will clear much of this as suspended matter precipitates out of solution. Sake, separated from the kasu (lees) in this manor is the best it can be! The use of the fune – 槽 – is more common than the use of the fukurozuri method. It was once the main method used for pressing the moromi, shibori – 搾り- but has now been mostly replaced by the Assaku-ki. Fune pressed sake is second to shizuku in quality. It is close though and extracts much more of the sake than can be collected using the drip method. The first extracts of the fune, shown at the end of the second video, is very similar in color and clarity to what is produced in the fukurozuri method. However, what we are looking at in this case is sake only under the weight of other bags of moromi. Eventually a lid will be placed on the fune with a tremendous force used to press down on the lid and squeeze the sake from the kasu. Joso -上槽 – the more formal name for shibori, is now most commonly done using an assaku-ki -圧搾 機 – press. The most well-known producer of assaku-ki is Yabuta. This method is far more efficient in pressing the sake from the kasu than these other two methods but still maintains a reasonably high degree of quality. There is almost nothing to see when a Yabuta is in use but I did find one video of an active Yabuta and one with the kasu being removed (Yabuta in action, P1000134.MOV). The reason there is nothing to see is because of the way the Yabuta works. It uses air pressure to squeeze the kasu, forcing the sake out through the mesh. The loud noise is the air compressor. Yabuta’s chart on the functioning of their machine is quite informative. For the most part, a pocket between two filters is filled with moromi and a bladder is then filled with air to force the sake from the lees. With the sake removed, the kasu is scraped off the filter and the process is repeated until all the moromi has been processed. Homebrewers are unlikely to have an assaku-ki available for their use but the other two methods, modified for scale are well within reach. The fact that these methods tend to produce better sake does not hurt either. The only down side is the lower efficiency but in small batch production quality over efficiency is usually a good trade-off. Author WillPosted on February 20, 2012 February 20, 2012 Categories Equipment, General Topics, ProcessTags assaku-ki, Joso, sake pressing, shibori, Shizuku, yabuta13 Comments on Sake Pressing: what method to use? While I was last at Uwajimaya to pick up some sake I noticed a couple of cartons of sake; two different brands. I recalled reading a piece by John Gauntner on boxed sake and thought this might be a good thing to look into and post my thoughts and findings. So, I picked up a carton of Hakutsuru Junmai, 1.8L for US $15. I looked for but did not see the same sake in a bottle for comparison. Marcus Pakiser invited me to come to the Young’s Market Annual Sake Show and attend his advanced saké course. I did not know what to expect but I was very interested in attending, so I blocked out the time on my calendar. While waiting anxiously, I wondered what the class could be that would make it as difficult as Marcus said it would be. There was to be a tasting test. I don’t think I am very good at understanding what I taste or detecting what is there. Given this, I was both excited and nervous. When the 16th finally rolled around, I went to the show which was being held at Saucebox in Portland. This venue was nice and intimate; much nicer than the Rose Quarter venue where I attended the show in the past. The introductory class was being held in a room in the main area not far from the bar. The advanced class was in a room that seemed not to have any internal door way to the rest of the restaurant so we all were going out into the rain to make our way back and forth to this room. The room that held the advanced class was filled with chairs and had three, maybe four, tables around the room with 8 full decanters on each. Some of the decanters could be mistaken for having water while others showed a yellowish tint or some cloudiness that you would not have with water. Hey, they must be filled with saké, right?! Each decanter had a number in front of it; from 1 to 8. He then introduced us to Israel from Wafu. Israel explained to us how they do tastings at Wafu and presented the “Wafu Saké Tasting Grid” to us. The grid starts with appearance at the top, moves to aroma, then palate and final assessment. Thinking about these, while tasting, often helps to notice aspects that might be easily overlooked. With this background, Marcus explained our task. We were to evaluate each of the 8 saké in front of us and determine which one matched each of the categories above. That was it. Wait, what?? You’ve got to be kidding. I’ve never heard anyone describe what is unique about domestic sake as a group; there all different, right… Aaah, now I see why Marcus said this was going to be so hard. Well, we all got started, each move to a table and started with the nearest decanter. For me this was decanter number 4. Kind of harsh, dry, very dry – ah, this one is probably the dry sake. I guessed that the SMV was +8. I next tried decanter number 6; candy cane aroma, sweeter side, SMV +2, rough finish maybe the yamahai. Moving on to decanter number 7; candy cane sweet, +2, clear, honeydew melon, a little creamy – possibly the Junmai. Next up for me was decanter number 8; very light, delicate, can’t smell a thing – Honjozo, I think this is the honjozo. Having hit the end of the table, I needed to go back into the fray where it was pretty crowded. The next decanter I sampled was number 5; very subtle flower aroma, +4 low acid, melon – may be the domestic. Squeezing in, I reached decanter number 3; Taste of sweet water, sweet but not cloying, +1, Simple, Domestic? Two domestics? No, I need to change one of them. At this point Marcus gave us an 8 minute warning. Just move on, two to go. I moved to a side table were the low numbered decanters were in the open. Now, decanter number 2; Lots of acid, +4, +5, Yamahai…Times out, I did not have a chance to try decanter 1. Wow, I got 4 of them, the ones with the stars. That is much better than I thought I would do. I would have guessed that I would get only 1, maybe 2, from sheer luck. I am very pleased with my performance on this. Some of those present were able to pick out the specific saké being used in each category; that’s outstanding. Maybe someday with lots of practice, I too will know sake that well. Anyway, this was a great experience for me. The class was followed by sampling saké from many of the companies that Young’s Market Distributes for. All in all, I believe there around 120 saké represented. Everyone involved did a great job! I want to apologize for missing my last post and not having something more topical for this post. I have lots going on so I have not been able to live up to my schedule. I was trying to complete my book: Brewing Sake – Release the Toji Within by the end of 2011while at the same time changing jobs. I didn’t make any of this work as planned. I did get the book to the proof stage and am working through the proofs now. It is so exciting to see the proof. They are just a very limited printing of the book itself. Seeing the cover I designed and that I worked on with my son on an actual book is just about hart stopping. It took me over a day of adding little post-it notes in the book for things that needed to be corrected before I could bring myself to actually just write in the book. It is meant to be a proof right? It is meant to be marked up. Anyway, it should not be long now before I have completed it and it is available for sale. I have a few ideas for future topics but they are not ready yet. One of the topics is sake oxidation. Many beer brewers that begin to brew sake are very concerned about oxidation and how to avoid it. However, many of the practices for making sake seem to actually encourage oxidation. This juxtaposition of concern and flagrant abuse confuse many brewers and so, warrant some discussion. Another topic is the use of charcoal filtering. I need to do lots of work on this one but I have heard that there are 6 to 9 different types of charcoal that can be used to get specific types of results. I am working on more information on special types of koji for making very high grade sake; that is the daiginjo. I have written about this before but need to firm up some of the details. Writing this last statement reminds me that sake brewing is done very differently by different people. One will insist on the need to stir the koji to break it up and get air to the koji while another, just as good brewer, will leave the koji in a single undisturbed bundle until done; creating one big clump that has completely grown together. Another topic that I have worked on, off and on, but have not cracked yet is the different ways that sake brewing changes with different types of water; that is soft vs. hard water. The old stories of about how water differs across japan and how regions went from having, at best, so-so sake to having really good sake all hangs on learning how to brew with soft water. As this knowledge spread so did the number of areas with good sake. Despite this, it has been very hard to get the specifics of the differences. Well, I am pushing on this area again and believe that I will make more progress this time. What would you like to know more about? Is there something you would like me to cover? Are you interested in writing a guest article? A little while ago Elise Gee provided an outstanding article. What is on your mind? OK, so you have some Sodium Hydroxide (NaOH) solution that you have been using to measure your sake or wine’s acidity but it has been a while. Maybe even a long while. You want to make a measurement but will it be accurate? Will it have absorbed too much CO2 to give an accurate measure? How do you know? Well, with a dilute solution of Hydrochloric acid (HCl), 0.1 molarity is good, you can answer your questions and get back to the task at hand. Unlike Sodium Hydroxide, Hydrochloric acid is stable so it can be stored and used over a long period without degradation. This stability makes HCl ideal for determining the actual concentration of your NaOH solution. which converts an acid and a base to water and a salt. This reaction along with the following equality can be used to determine the actual concentration of the NaOH solution if we have accurate knowledge about the other values. Given this, if we titrate to neutralize 10ml of a 0.1 Molarity solution of HCl and it takes 11ml of your NaOH solution to neutralize the HCl then the molarity of the NaOH solution is 0.0909… M or about 0.091 M. Now that you know the molarity of the NaOH solution that you are using, you can substitute this value into the equation you are using to determine the acidity of your sake while following the standard titration procedure. One additional benefit of being able to determine the molarity of your NaOH solution is that you can actually make your own. With this you are no longer dependent on your lab supply store for NaOH solutions with an accurately known molarity. The mole mass of NaOH is roughly 40 grams. So to create a 0.1 molarity solution of NaOH we start with 1 liter of distilled water and add 4 grams (0.1 x 40) of NaOH granules. This gets us very close to the 0.1 molarity solution we want but with the accuracy of our equipment it is not close enough. With the above procedure we can get the needed accuracy. In part one I talked about how to measure the Nihonshu-do or Sake Meter Value (SMV) or your sake. In part two I covered how to measure the Arukoru bun (アルコール度数) or Alcohol percent by volume (%ABV). In part three I covered how to measure the sando or acidity of sake. In this part, part 4, I will cover how to measure the amino sando of your sake. As is the case for measuring the sando, you will need some Sodium Hydroxide (NaOH) solution usually at a concentration of 0.1 Molarity (M), phenolphthalein, a small beaker to mix the sample and chemicals in, and a syringe to measure with. All of this can be purchased as a wine acid test kit. In addition you will need some formalin1 solution. As is the case in measuring sando, you can use the phenolphthalein as an indicator or a pH meter to determine the point at which the pH reaches 8.2. The method used to measure the amino sando is very similar to the method for measuring sando. In fact, it incorporates the sando method as the first step in measuring the amino sando. This is because amino sando is just a specialized acid that is locked up and hidden in the structure. To measure the amino sando we must first remove or neutralize other acids so that they are not counted along with the amino acids. This is accomplished in the first titration step which determines the amount of base require to neutralize the acid. After our sample solution has been neutralized there are no more extra H+ to worry about and we can focus on how to make the amino acids visible, or at least measurable in some fashion. This is done with a formalin solution. The formalin solution reacts with the amino acid freeing an H+ from each amino acid structure. This free H+ can then be locked up using a base just as we did to measure the acid levels. So, one more round of titration using our base solution, sodium hydroxide (NaOH) will give us the level of base needed to neutralize the newly exposed acid so we can calculate the amount of amino acid as glycin, the simplest amino acid. If that seems a bit intimidating, don’t worry, we will take it step by step from here. OK, first we need to measure out 10ml of sample sake to evaluate. Place this in a beaker and add a few drops of phenolphthalein. The drops are not needed if you will use a pH meter. Load the syringe with about 10ml of NaOH and record the exact amount in the syringe for later reference; call it R1. At this point, it is time to add, drop by drop the NaOH from the syringe to the sample watching for the indicator to change color to a light ping for at least 30 seconds. Swirl the sample after each drop as you go. If on the other hand you are using a pH meter you should gently stir the sample with the meter probe to get a correct reading. Once the color changes and holds its light pink color for at least 30 seconds you have neutralized the sample. Record the NaOH level now present in the syringe; call it R2. The difference between this and the earlier recorded level, (R1-R2) can be used to determine the sando (acidity). Up until this point the procedure has been the same as measuring the sando. It is at this point that we depart from the sando method. Set the neutralized sample aside for use once we have a mixture based on the formalin ready. Mix 50ml of formalin with 50ml of distilled water. Using the same titration procedure, neutralize the mixture at a pH of 8.2 or where the indicator turns light pink for at least 30 seconds. Remember to add several drops of phenolphthalein if you are using the indicator. There is no need to record the amount of NaOH used for this procedure. OK, we are ready for the final step. Measure 10ml of the neutralized sample and 10ml of the neutralized formalin mixture and place in a beaker for a total of 20ml. Reload the syringe with NaOH and record the amount contained; call it R3. If you have been using phenolphthalein there should be enough present without any addition. Titrate this 20ml sample until it reaches neutrality at pH of 8.2 or until the color changes to a light pink for at least 30 seconds. Record the final level of NaOH in the syringe; call it R4. The difference between this and the previous recording will be the amount of NaOH required to neutralize the amino acid; (R3-R4). Where the BaseMolarity is the concentration (moles / liter) of NaHO in distilled water, BaseVolume and SampleVolute are the amounts of NaHO and Sample solutions in ml. 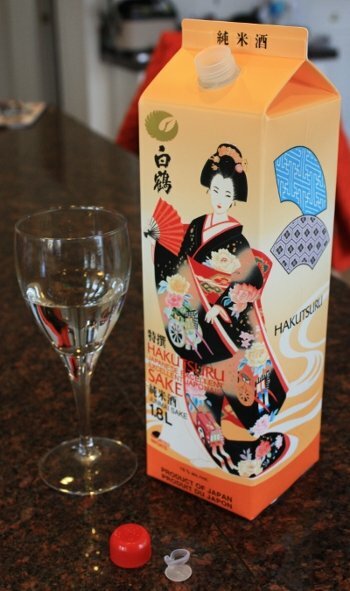 Succinic acid, along with malic and lactic acid are the most abundant acids in sake. As discussed in part three, succinic acid has a reaction ratio, MoleRatio, with NaOH of 1:2 giving rise to the ½ in the Sando equation. The amino acid glycin reacts with NaOH in a 1:1 reaction giving rise to the multiplier 1 in the Amino Sando equation. The molecular mass (MoleMass)of succinic acid is 118 while the molecular mass of glycin is 75. As you see, these have been substituted in the equations above. Using a pH meter can be slower and more tedious than using phenolphthalein but the pH meter will be more accurate. In either case, any amount that you are off on any of the titration steps, first for sando, second for formalin or the final step for amino sando, will throw off the following step or be thrown off by the previous steps; that is, the error will accumulate with each step. Well, there you have it, the procedure to measure the sando and amino sando of your sake. Well over a decade ago, I became smitten with nihonshu at NYC sake bar and drinking institution, Decibel. I didn’t know it at the time, but my experience there–its hidden-away, speak-easy location; a secret grotto showcasing a depth of sake that I had no idea existed–would lead me on a pilgrimage to learn more in Japan and eventually to brewing sake commercially. 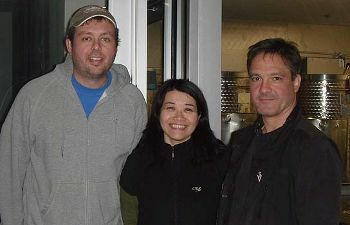 In January 2006, I travelled to Kamakura where I met eight other foreigners interested in sake. We gathered at a local art space to learn and discern the drink with John Gauntner, preeminent American sake expert and author, who has lived in Japan more than half his life. Sake Filtering – Is this Muroka (無濾過)? Not very encouraging in turns of being able to recover a large percentage of the sake as clear sake. Anyway, I had been thinking about filtering sake and thought that this maybe a good batch to give it a try with. You may recall that the fermentation went very slow and I pressed it too early despite it having had more time to ferment than most. The moromi went through stages of smelling like green apples, strawberries and finally banana’s. These aromas have been very strong and are very evident the minute I open the cooler. 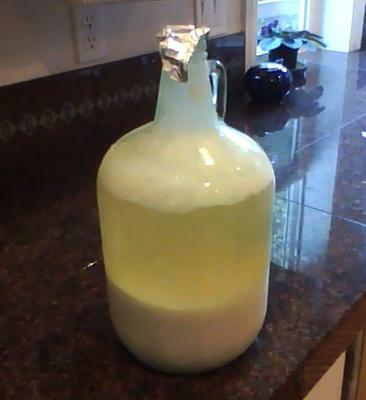 At one month after pressing the banana aroma continues to be very strong; Ginjo-ka on steroids. Author WillPosted on October 29, 2011 March 10, 2019 Categories Equipment, General Topics, ProcessTags Bodai-moto, Sake Filtering7 Comments on Sake Filtering – Is this Muroka (無濾過)?